It’s the first Toyota to be powered by the BMW 1.6litre D-4D diesel engine and the compact MPV Verso also packs in a few other surprises for its 2014 spec revision. Firstly, the new engine is much better than the one it replaces with improved efficiency and emissions; it produces around 110bhp and will deliver a claimed 63 mpg on the combine cycle (though Toyota is flagging up that the diesel Verso can do 72mpg in the right conditions). Having said that it looks like Toyota have carried out several modifications to the original version which still better than the 2 litre diesel it replaces. This is the first vehicle in the Toyota range which adopts a BMW engine and there are four trim levels which utilise it. However, the figures for reaching 0 to 62 mph is a fairly sedate 12.7 seconds with a top speed of hundred and 115mph in the diesel engine version. The new Toyota Verso has also been given a new spec level, called the Trend, which has a ‘floating roof’ effect along with front parking sensors, 17 inch alloys and Toyota’s impressive Touch 2 with Go multimedia and navigation system. This system will also be introduced all spec levels except the entry-level Active model and it now comes with several connected services such as Google’s ‘Street View’ and updated traffic information from TomTom. Other standard kit for the Toyota Verso Active includes air con, USB connectivity, stability control, and electric heated door mirrors. Depending on the Toyota Verso model chosen, the spec level for the entire range is actually quite impressive and includes things like cruise control, auto wipers and headlamps, Smart entry and start while some models have the option of having a panoramic roof. Some models also have a rear-view camera fitted to help with parking. There’s also the obligatory Bluetooth function for making hands-free phone calls and for sending and receiving text messages. The system also allows for the easy connection of iPods and MP3 players which will also display the album and track information, where it is available. The new multimedia screen in the 2014 Toyota Verso has four times as many pixels as the previous model which makes it brighter and the design for controlling and accessing information is via this function. Another first for the Toyota Verso range is a six speed manual transmission which is married to a stop-start system which should help fuel economy. 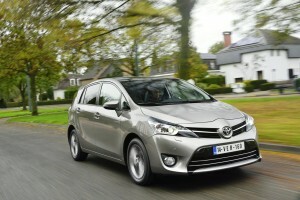 Prices for the 2014 Toyota Verso range have yet to be announced but orders are being taken from February with deliveries the following month. The overall package for the Toyota Verso is quite impressive and offers a lot to motorists who want value for money and a lot of extras. This entry was posted in Car Leasing, Cars, Family Car, Popular Cars and tagged lease a toyota verso, toyota, toyota verso, verso by Steve Lumley. Bookmark the permalink.